Pacific Paint (BOYSEN) Philippines, Inc., 51st largest paint company in the world, recipient of Reader's Digest Most Trusted Brand Pacific Paint (BOYSEN®) Philippines, Inc.
Pacific Paint (BOYSEN®) Philippines, Inc.
Pacific Paint (BOYSEN®) Philippines, Inc. was founded in 1953 as a repacker of paint and lacquer thinners under the trade name Columbus. In 1958, the company expanded its operations and started paint production with the introduction of NATION® House Paints, an economy grade paint. In 1960, the company acquired the license to manufacture BOYSEN® Paints in the Philippines from the Walter N. Boysen Company of Oakland, California, USA. This access to new technology gave birth to a comprehensive line of premium grade BOYSEN® decorative coatings for architectural and some industrial applications. Through the foresight and dedication of its founders and all the pioneer employees, Pacific Paint was able to capture the lion’s share of premium quality paint market in the Philippines in the mid 1970’s – outselling all leading U.S. brand paints that also operated production facilities in the country. The most rewarding experience for the company is to find out from The Coatings Agenda Asia-Pacific 2001 that Pacific Paint ranked no. 58 in the world’s top paint makers. BOYSEN® has also proven itself as the industry leader in product innovation with its constant development of new products to suit specific market needs, especially in environment friendly paints. Through constant progress and innovation, Pacific Paint keeps elevating the level of confidence bestowed by its customers. In 2000, Pacific Paint commissioned a fully integrated state of the art manufacturing facility just outside Metro Manila that is the biggest and most modern paint production facility in the country placing the company at an even better position to service its customers with reliable supply and consistent product quality of BOYSEN® Paints. To better service its customers, a Technical Service and Project Management Department has been installed to provide assistance to consumers with product inquiries and product specifications, instruction of proper surface preparation and painting techniques. In 1995, BOYSEN® Paints was awarded the PS Mark Distinction of Quality. BOYSEN® Paints’ quality is recognized and well accepted not only locally but also in other countries, as seen by the steady growth of its exports to China, Guam, and Saipan. In its more than 50 years of prominence in the Philippine building materials industry, BOYSEN® has earned milestones for delivering high quality paint and innovative products. It is the first Filipino paint company to be given by SPIK (i.e., also known as the Chemical Industries Association of the Philippines) the privilege to use the Responsible Care logo. BOYSEN® belongs in Coatings Agenda Top 50 Paint Companies in the World in terms of volume produced. In its July 2010 Issue, Coatings World ranked BOYSEN® Paints as the 51st largest paint company in the world. 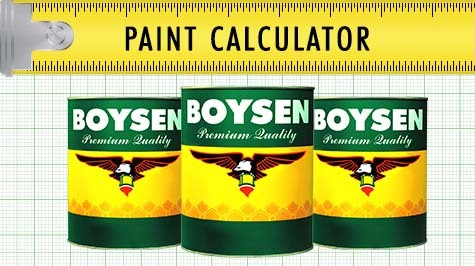 BOYSEN® was one of only two paint companies from the ASEAN region and the only Filipino company to make the list. BOYSEN® Paints is also recipient of the Reader’s Digest Most Trusted Brand for seven straight years since 2006, the Platinum Status makes it one of only two paint companies in the Asia-Pacific region given the distinction.